LAS VEGAS – September 24, 2018 – Over 400 pieces of authentic automobilia items, including nearly 50 items from the Robert K. Haines Sr. Estate Collection, are set to sell on the auction block – all at No Reserve – during the Automobilia Auction at the 2018 Barrett-Jackson Las Vegas Auction, Sept. 27-29, 2018, at the Mandalay Bay Resort and Casino. 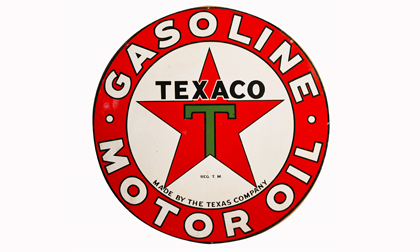 From 8:30 a.m. until 11:00 a.m. daily, bidders will have the opportunity to take home a variety of coveted pieces, highlighted by a 1930s Texaco Motor Oil-Gasoline 42″ double-sided porcelain sign found with day-one gloss and colors (Lot #8209) from the Robert K. Haines Sr. Estate Collection. The entire automobilia auction will be streamed live at Barrett-Jackson.com and through the “Beyond the Block” mobile app, with remote bidding available via ProxiBid. Also set to be auctioned is a near-flawless 1959 Sinclair Oil double-sided porcelain service station sign with Dino logo (Lot #8210), one of the nicest examples known in existence. A 1920s “Under the Chassis Inspection” double-sided tin automotive garage sign with period sedan logo (Lot #7225) and museum-quality NOS 1930s-40s “Genuine Parts” double-sided tin flange sign with period Chevrolet bow-tie logo (Lot #7213) ‒ found unused in the original shipping box – are also among the most coveted automobilia items for Las Vegas. Other highlights from the Robert K. Haines Sr. Estate Collection include a highly prized circa 1930s-40s ShellMex Oil (United Kingdom) clamshell-shaped one-piece gas pump globe (Lot #6267) in excellent condition and a very hard-to-find circa 1940s-50s Major Supreme one-piece milk-glass gas pump globe from the United Kingdom (Lot #6267.1). A large, desirable 1930s Shell Oil single-sided three-dimensional clamshell-shaped porcelain service station sign (Lot #8195.1) was designed for neon. Click here to view the full automobilia docket for the 2018 Las Vegas Auction or view the vehicle docket for the 2018 collector car auction, which begins at 11:00 a.m. daily following the automobilia auction. Advance tickets and All-Week ticket packages are for the 11th Annual Las Vegas Auction are available at Barrett-Jackson.com. Consignments for the 2018 Las Vegas Auction are now sold out. Consignments are being accepted for the 2019 Scottsdale Auction; to submit an application, click here. For information on becoming a bidder, visit www.Barrett-Jackson.com/bid. Also, follow Barrett-Jackson on Facebook, Instagram, LinkedIn and Twitter for the latest news and information heading into the 2018 Las Vegas Auction.